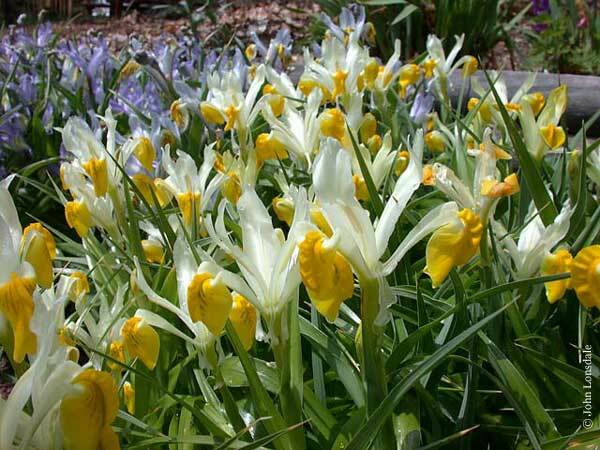 The Junos make up the largest group of bulbous irises with something around 60 species. 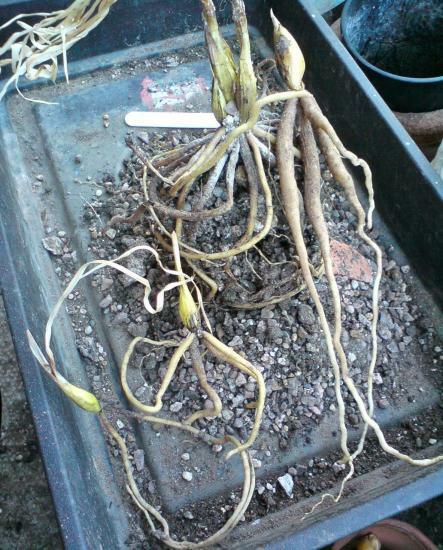 Officially the subgenus 'Scorpiris', they form a natural group characterized by their bulbs which are somewhat fleshy and have from a few to several thick, also fleshy storage roots. The leaves are opposite in a flat array, technically distichous; but once seen, easily recalled. The flowers too share some general characters such as small standards. 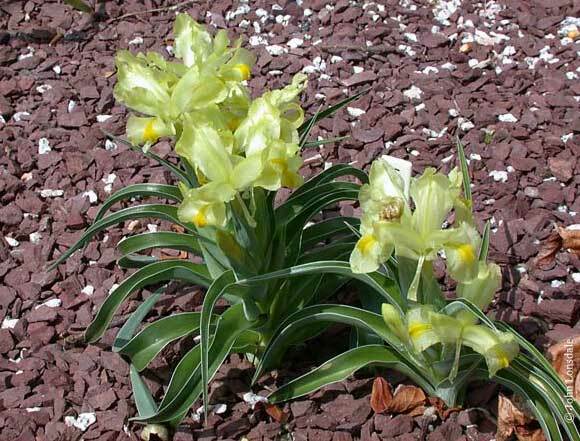 Normally erect in most iris, here they are frequently nearly absent or small and pendant. 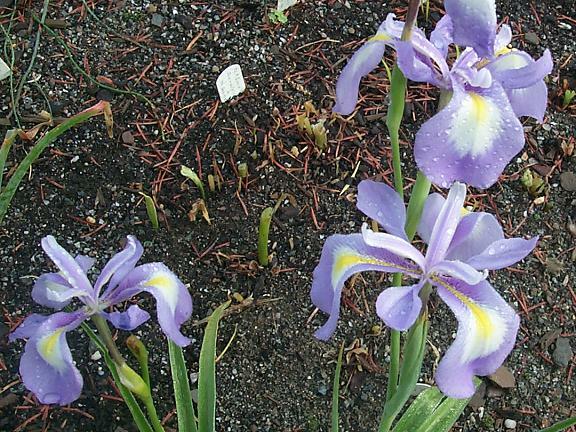 Iris cycloglossa is a widely grown exception. The overall form of most junos is very distinct. 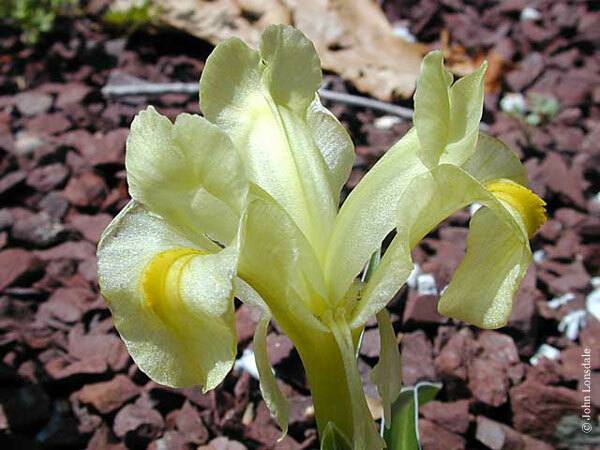 The commonest larger Junos, such as Iris bucharica and Iris magnifica, often resemble small corn plants. Except for a single Mediterranean species, most occur from the middle east to Central Asia, but none quite get to China. Some species are hardy and easy to cultivate as far north as Canada, while others are very tender even in English gardens. All are dormant in summer, and produce foliage either in mid-winter or early spring. Culture is variable, but good drainage and summer dormancy are common requirements. Some species demand copious water in spring, others far less. Check specific care for each species. This information provided by Jim Waddick. Species and cultivars A-I found on this page. Iris aucheri This species from Northern Iraq, southeastern Turkey, northern Syria, western Iran and Jordan is one of the earliest to show foliage, but latest to bloom. It is almost icy blue in its typical form, but can be white to blue with a yellow ridge on the falls. The flowers have a violet-like scent. It is easy, hardy, and vigorous, preferring sun and well drained soil. Flower photos by John Lonsdale. Photo of bulbs by Peter Taggart. 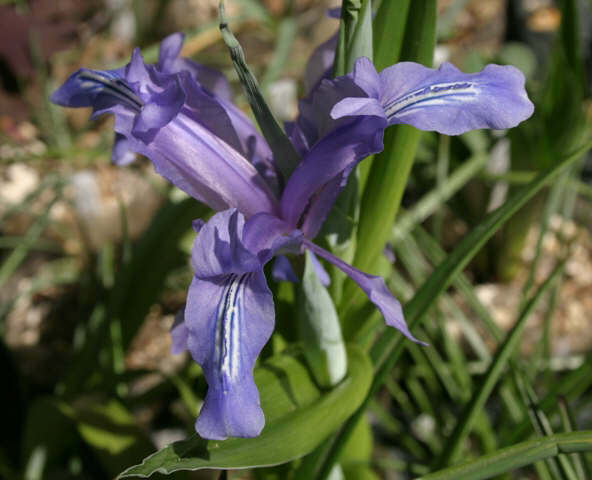 Iris bucharica Foster is found in Northeastern Afghanistan, Tadjikistan, and Uzbekistan where it grows on stony and grassy slopes. It is one of the most frequently cultivated Junos with large glossy green leaves. The flowers are creamy white with a yellow blade. 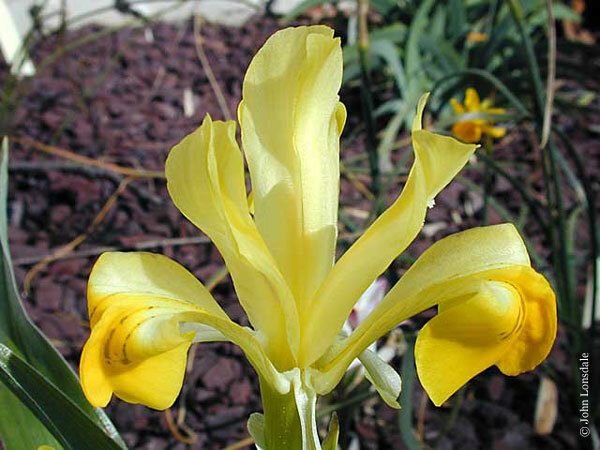 There is also a plain yellow form known in gardens as Iris orchioides which is really this species. It is one of the easier species to grow in a sunny well-drained border. The all yellow forms tend to have more spindly flowers and to be smaller plants, betraying its afinity with I. vicaria; these are being referred to as I. bucharica 'Sanglok' while awaiting formal description. There is also a pale form known as 'Tony' for Tony Hall distributed by Janis Ruskan. They are not as easy to grow as the widely circulated bicolor forms. 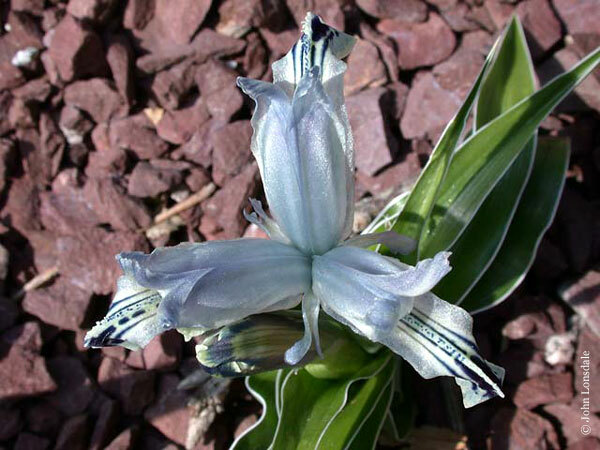 The flower photo by John Lonsdale and photo of bulbs by Peter Taggart are of the bicolored form. Iris bucharica 'Duschanbe' Photo by John Lonsdale. 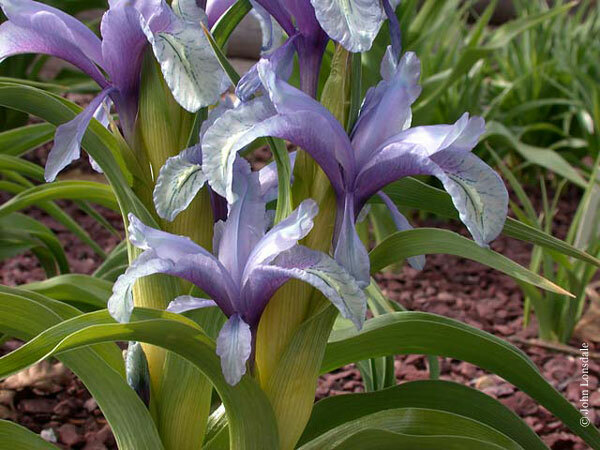 Iris bucharica 'Princess' is a fragrant cultivar that smells deliciously of Freesia. The flowers, crowded in the leaf axils in April-May, are white with yellow blades on the falls. 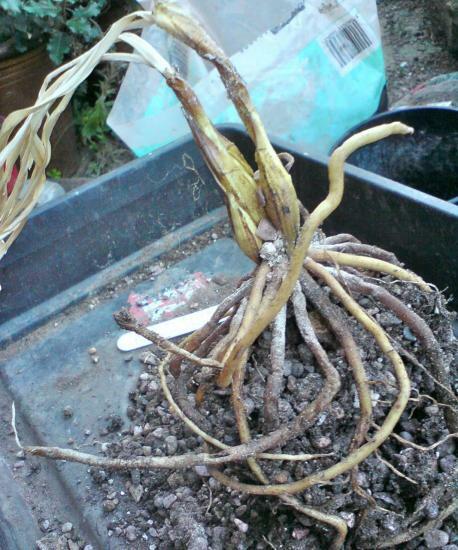 Photo from Paige Woodward who writes that this plant likes full sun and good drainage but grows well in the open garden and does not need to be lifted over the summer. 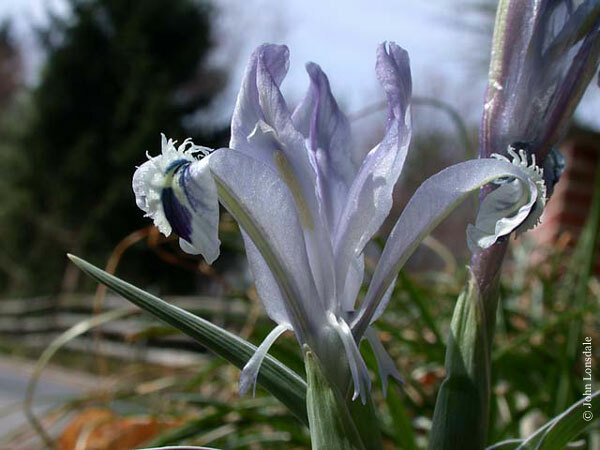 Iris caucasica grows on mountain slopes in Turkey and the Caucasus. Leaves are gray green and flowers yellowish green with a yellow ridge on the falls. Photos by John Lonsdale. 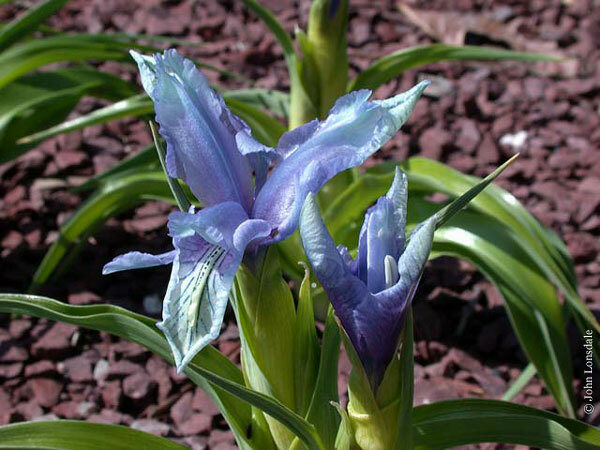 Iris cycloglossa is a species from Western Afghanistan that somewhat resembles a Dutch Iris and is a rich blue-violet. It comes from areas subject to winter-spring floods so tolerates a lot of water and generally moister growing conditions than many other junos. It's one of the very last junos to bloom, and it's a beauty with a very different look. It's an "easy doer" when grown in sandy soil, and blooms in June instead of April-May like most junos. The flowers are outlandishly large, and luxuriantly floppy for the size of the plant, providing an unusual flouncy rabbit-ear look . Flower photos by Mark McDonough and Bill Dijk. 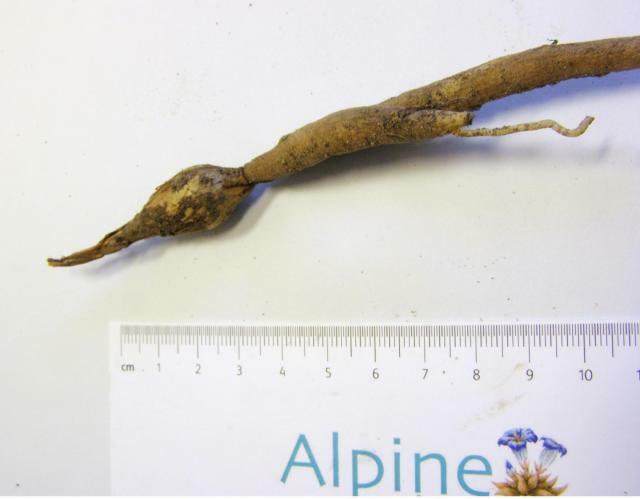 The bulb photo by Peter Taggart shows this species has tuberous roots, which break off easily. 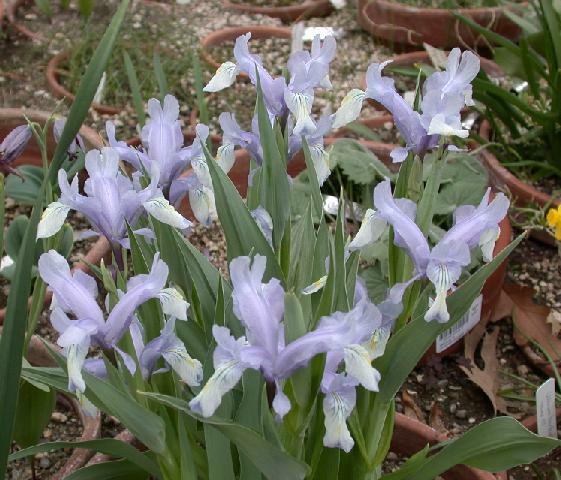 Iris fosteriana Aitch. & Baker from the dry steppe of NE Iran to NW Afghanistan is a spindley juno with a slim bulb with a long neck. The form Peter Taggart grows has a hard outer tunic on the bulb which is a warm cream colour while the inner tunics are very thin, papery, and saffron yellow, as is the bulb. 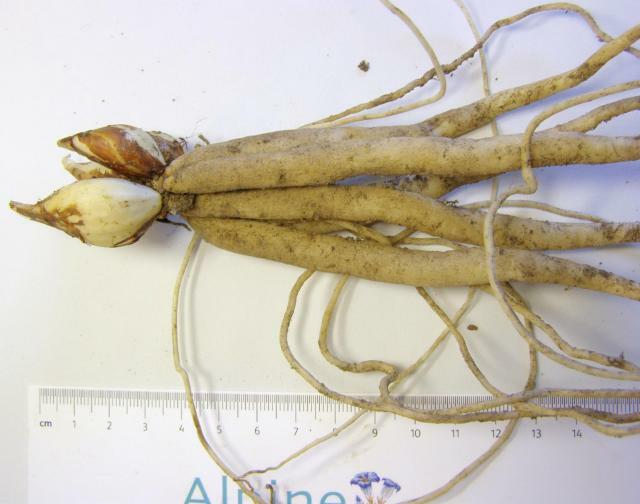 The tuberous roots are long, perhaps 6 inches, thin and white. They radiate outwards from the basal plate. The leaves emerge early (December) and are narrow and deeply channeled, near vertical then at March flowering time the leaves curve outwards, grey below and green above with a white edge to the leaf. The flower stem shown is unbranched and hidden by leaves until fruiting. There is no aril on the seed. 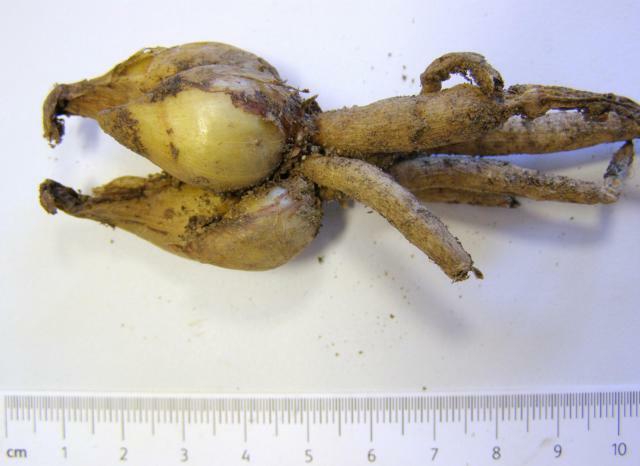 Photos by Peter Taggart show the flower, then bulbs above tuberous roots. 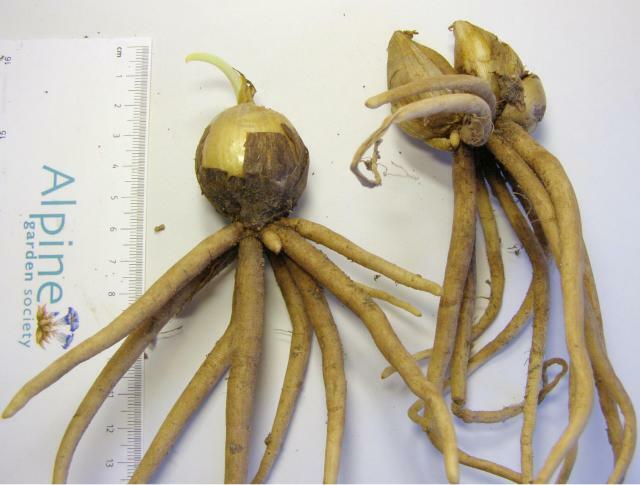 The third photo compares bulbs of I. fosteriana (left) to I. cycloglossa (right). 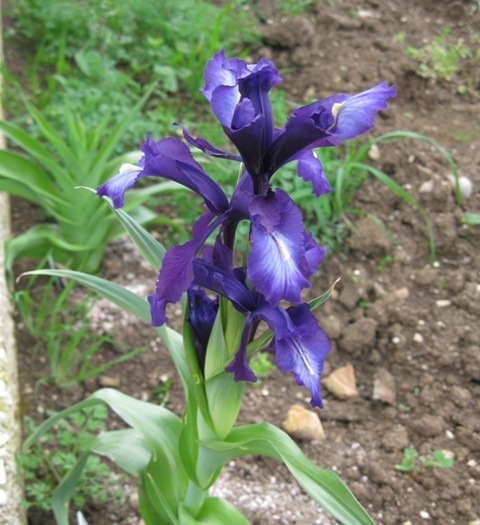 Iris galatica is from cooler higher altitudes in central to north Turkey. It is variable in color from reddish-violet to greenish yellow, or silvery purple. Photo by John Lonsdale. 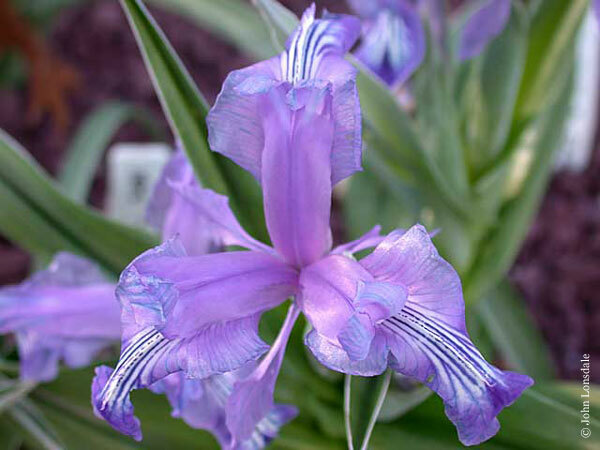 Iris graeberiana from Central Asia is blue tinted violet or lavender and strongly veined around the crest. It is an easy vigorous juno that only gets to 6 to 8 inches tall. Here it is blooming on April 5, 2006 in the USDA zone 7 garden of Jim McKenney. 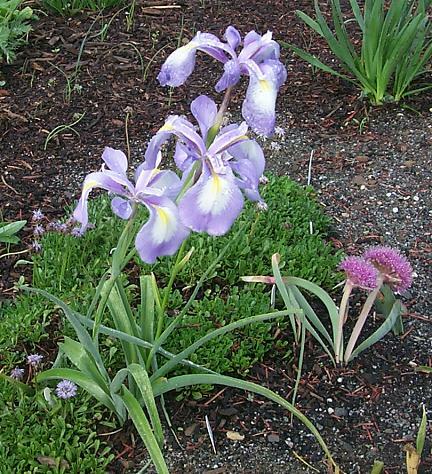 Iris graeberiana 'White Fall' (Juno) purchased two years earlier as a single bulb from the Dutch grower Antoine Hoog, shown flowering in a bulb frame in Oregon in late March. Photo by Jane McGary. This cultivar is more or less sterile and thought to be a hybrid. 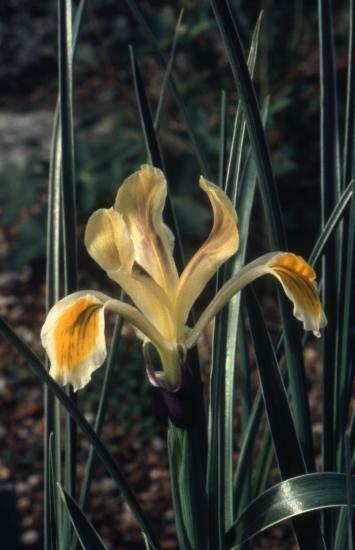 There are two other sterile or near sterile hybrids of Iris graeberiana in circulation: Iris graeberiana 'Yellow Fall' is very similar but slightly smaller than 'White Fall' but with more yellow staining on the flower and Iris graeberiana 'Dark Form' is a little taller than the form known as Iris zenaidae but otherwise indistinguishable except that it is sterile. 'Dark form' is the most robust and prolific flowering of these forms though the flowers are a little smaller. Bulb photo by Peter Taggart. 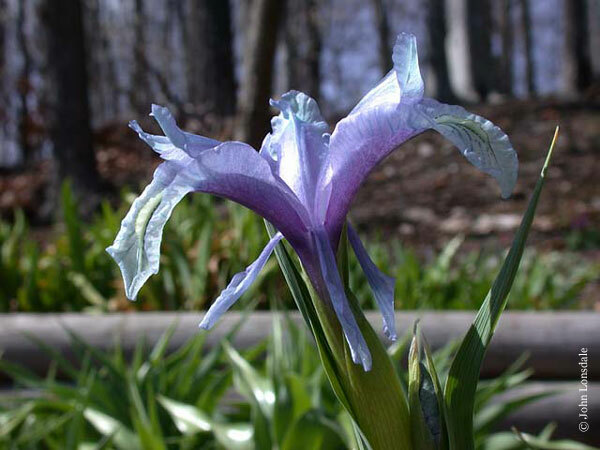 There is a violet-blue form of I. graeberiana found in the Tien Shan Mountains that is known under the name Iris zenaidae Vved. It has flowers spotted violet on the haft of the falls. 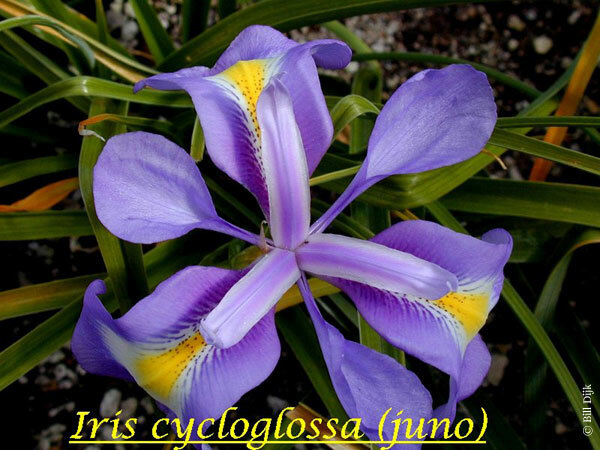 It is not listed in any of the major data bases (Tropicos, The Plant List, IPNI, the Kew check list) but is still grown by many and sold as Iris zenaidae. 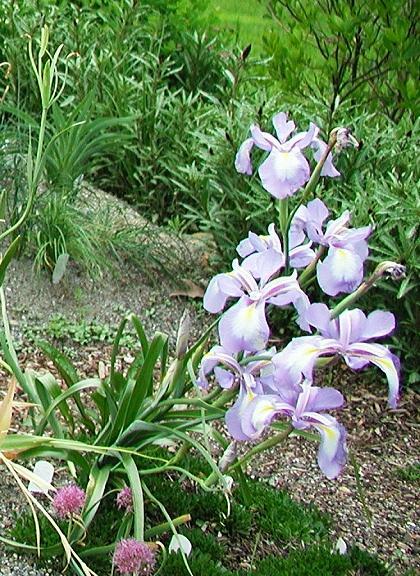 Tony Halls research at Kew has concluded that Iris graeberiana and Iris zenaidae are the same species. 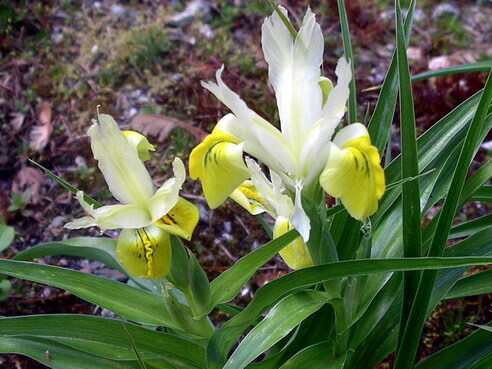 A number of people who grow this think there are significant differences between this form and Iris graeberiana. Photo by John Lonsdale. 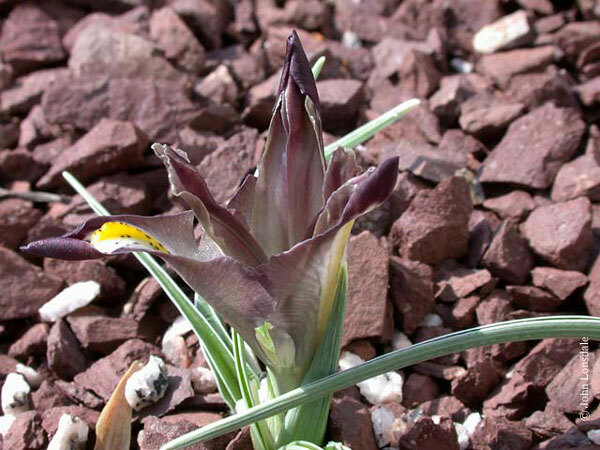 Iris inconspicua from the Tien Shan Mountains in Central Asia is a very short plant (2" = 5 cm) that is pale lilac, spotted green with a white crest. Iris inconspicua × Iris kuschakewiczii Photos by John Lonsdale.